Compete at the highest level of street racing with Need for Speed™ ProStreet. It's no longer good enough to simply rule your local neighbourhood you need to dominate on a global stage. 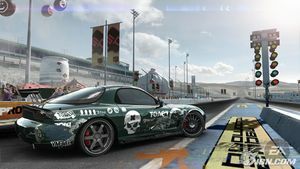 Build the ultimate battle machine, take it to multi-disciplinary showdowns and pit your skills and reputation against the world's best street racers. This is your chance to prove that you have what it takes to be crowned the next street king. 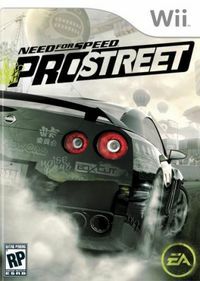 Need for Speed ProStreet is your ultimate taste of the chaos and unbridled adrenaline of street racing. Pushing yourself and your car to the edge can lead to mistakes and this time those mistakes have consequences. Think swirling fields of debris, shredded fiberglass and heinously twisted metal. Every dent, every scratch and every crumpled body panel is a battle scar, proof of your commitment and competitive mettle. Real, Adrenaline-Fueled Racing: Experience the raw power of steet racing with a brand new physics engine and feel the fire of competition with an intuitively refined AI engine that smartly delivers on real driving behaviours. Dominate Across All Racing Disciplines: Becoming the Street King isn't about winning one single event. You need to prove yourself in four distinct styles of racing. Unleash the power of the beast in a reinvented Drag mode. Master the art of control with Tandem drift, and experience the intensity and rivalry of elite competition with Grip Racing. Completely new to the game is Speed Challenge, an ultimate test of speed and control. Ride the Edge of Disaster: Street racing is violent and mistakes have consequences. Cars can be torn apart using truly advanced and comprehensive damage capturing technology. Witness cars colliding, metal denting, and debris billowing. To further amplify the realism, crash repercussions such as smoke, dirt spray and dust clouds can affect all racers on the track. Redefining Competitive Social Play: Packed with ingenious features that will amp the spirit of competition and create for the ultimate showdown between you and your friends. The rules have drastically changed making for a more intense and aggressive online arena. Performance Drives Results: Your machine doesn't have to look like much - as long as there are secrets underneath that hood. For the first time ever, see the impact of the "AutoSculpt™" technology on performance - all in real time. Sculpt your cars inside a wind tunnel and choose from hundreds of real-world, aftermarket parts to build your ultimate battle machine. Share your Tuning Capabilities with the World: Once you've designed it share it. The all new Blueprints feature allows you to upload your visual and performance customization settings online. Once downloaded, you'll be credited each time your design is used to dominates in a race. Photo Real Cars and Worlds: Boasts cars that exude power, menace and raw energy with their look and sound along with the most realistic smoke ever seen in a racing game. Authentic and relevant real world track locations and the best street drives from around the globe combine to create the most stunning racing environments ever. This page was last modified on 28 June 2009, at 13:50. This page has been accessed 576,281 times.